We’re really celebrating Valentine’s Day this year, going all out. I think our celebration will be entirely unique, even for us. No, we’re not reserving a suite at a fine hotel, with lobster and filet mignon. No champagne in my slipper. I don’t expect diamonds or a dozen roses. I’m expecting much, much more. Like many U.S. holidays, Valentine’s Day probably began as a liturgical celebration for one— or maybe more— early Christian saints named Valentinus. Several martyrdom stories were invented for the various Valentines, and all are associated with February 14. One account says, for example, that Saint Valentine of Rome was imprisoned for performing weddings for soldiers who were forbidden to marry, and for ministering to Christians, who were persecuted under the Roman Empire. As if that weren’t enough, according to legend during his imprisonment he healed the daughter of his jailer. No evidence whatsoever exists for this lovely myth or other religious associations for Valentine, but these fragile foundations support immensely profitable enterprises. The day was first associated with romantic love in the circle of Geoffrey Chaucer in the High Middle Ages when the tradition of “courtly love” flourished. Unlike many examples of real love, “courtly love” emphasized nobility and chivalry. In other words, the lovers might not consummate their love but enjoy all the fun of a flirtation, complete with sighs, illicit meetings, and secret messages and gifts. In 18th Century England, lovers began to express their love on Valentine’s Day by offering flowers, sweets, and homemade greetings which became known as “valentines.” At this time, some of today’s symbols evolved, including heart-shaped outlines, doves, and the figure of the winged Cupid. In 1797, a British publisher issued The Young Man’s Valentine Writer, which contained sentimental verses for the young lover unable to compose his own. Too bad some of today’s love-song-writers don’t have a copy! 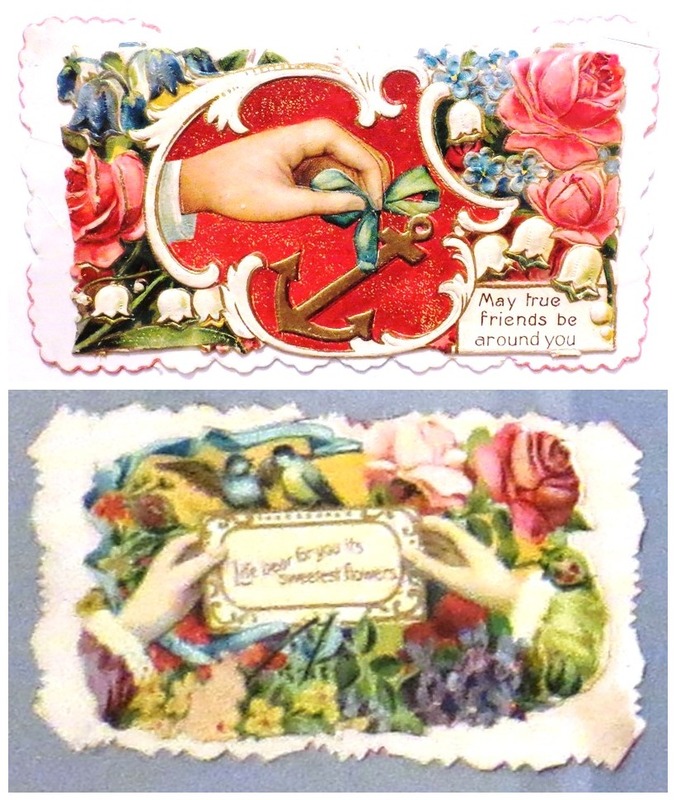 Printers had already begun producing cards with verses and sketches, so when postal rates dropped during the next century, sending valentines became more popular. During the early 19th Century, paper valentines were assembled in factories, with real lace and ribbons used to create the fancier ones. 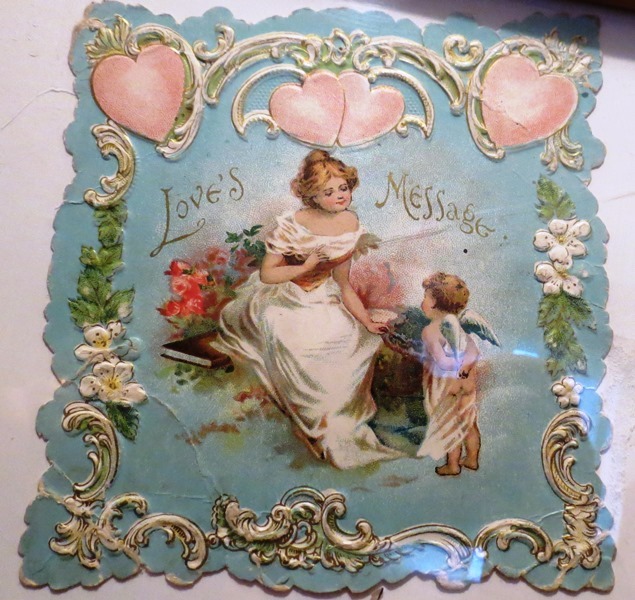 In the U.S., the first mass-produced valentines of embossed paper lace were made around 1847 by a Massachusetts woman whose father ran a large book and stationery store. 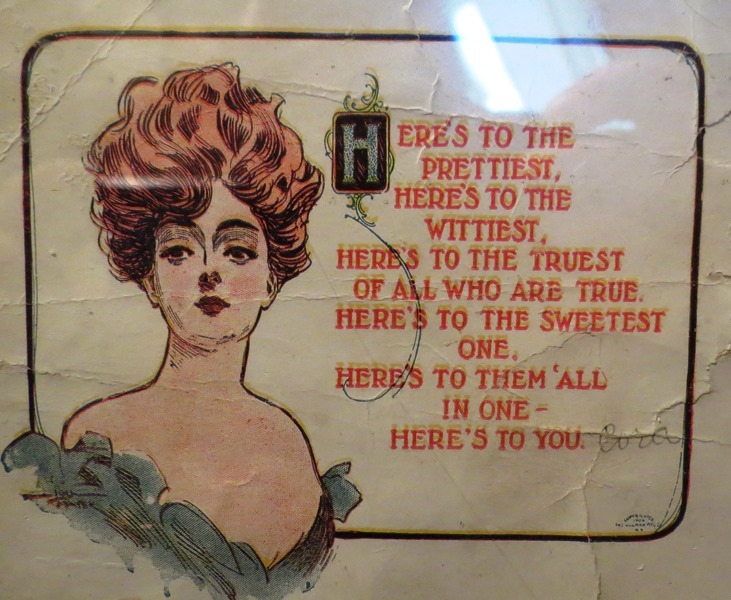 Later, handwritten valentines were mostly replaced by mass-produced greeting cards. Encouraged by manufacturers alert to the power of the dollar, many lovers sent gifts such as chocolates in red, heart-shaped boxes, flowers, and jewelry. The diamond industry began to promote Valentine’s Day with vigor in the 1980s. Today, the U.S. Greeting Card Association estimates that about 190 million valentines are sent each year. On Valentine’s Day 2013, according to the experts, the average American spent $131 sending greetings— mostly to family members and teachers. The rise of the Internet is creating new traditions as millions of people send digital greetings— e-cards, love coupons, or printable greeting cards. An estimated 15 million e-valentines were sent in 2010. None of this hoopla will make the slightest difference to me or to Jerry. We’ll celebrate Valentine’s Day in our own ways, and our expenditures will be considerably less than $131. Possibly nil. Since the holiday falls on Saturday, I hope to entice Jerry to make crepes, which I’ll fill with strawberries and sour cream with a touch of powdered sugar. I plan to spend the rest of the morning doing what I love: writing, and being as grateful as I am every day for my freedom to choose my work. I’ll have lunch with two women friends, and spend the afternoon helping them clean the Hermosa Arts and History Museum. Because I want to. Meanwhile, Jerry will be attending a special blacksmithing event called a “Hammer-in.” He’ll spend the day firing up a forge, heating chunks of iron until it glows like the fires of hell or the glowing eyes in those tacky werewolf movies. The hammers will clang and ring as he discusses with like-minded friends— not all of them male— the fine points of blacksmithing. At the end of the day, we’ll get together, share a meal and tell each other how much fun we had. 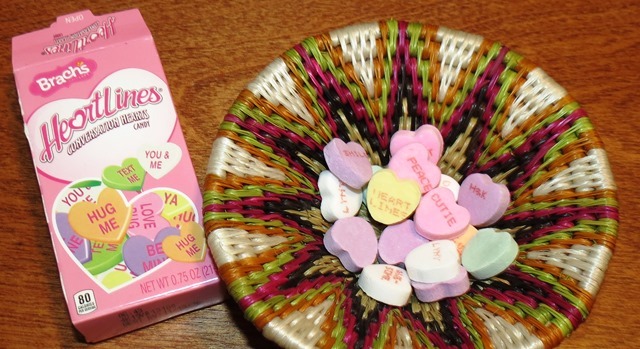 For dessert, I’ll serve some old-fashioned heart-shaped candies with loving slogans on them; I paid thirty-three cents for the box. We’ll probably play Scrabble. We’ll do this because we know what sustains real love isn’t chocolate— luscious as it is— or greeting cards or diamonds. Love means allowing the loved one the freedom to choose, even on special days. 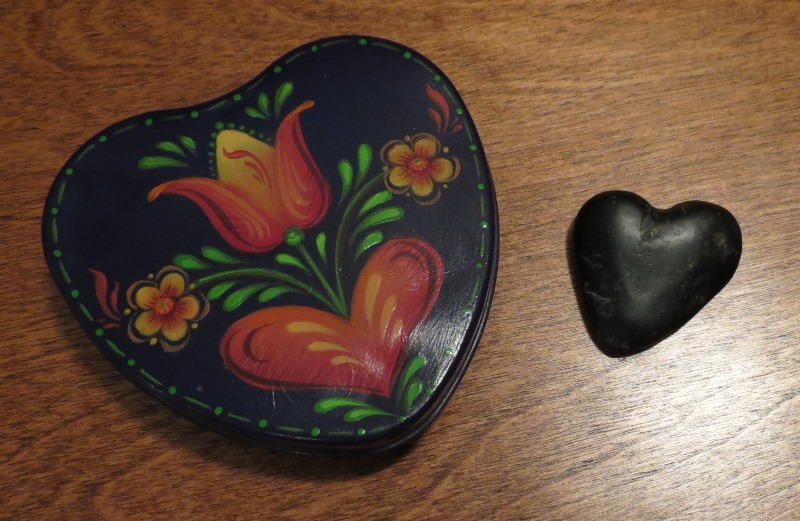 A month or so ago, as we walked the dogs up the driveway, I picked up a black stone that resembled a heart. Jerry promptly claimed it. A day later, he gave it back to me slightly reshaped, and polished. I often carry it in my pocket. That’s my permanent Valentine card. I hope that you and your special loved one will enjoy the same loving freedom, on Valentine’s Day and for the rest of the year.